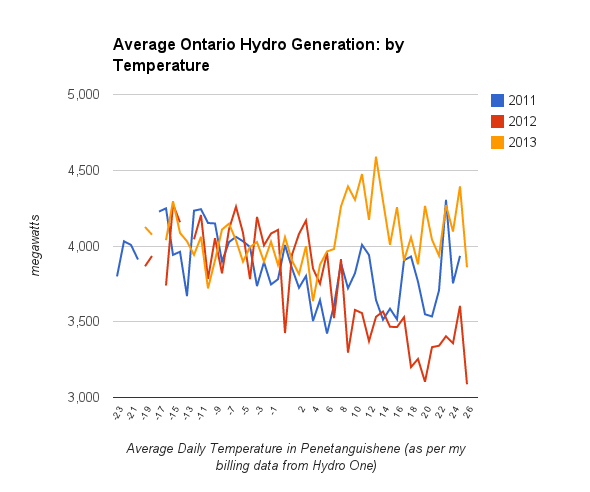 A quick post on some data views I found interesting after linking my personal hydro one data to Ontario's system operator (IESO) data for Ontario's electricity sector. 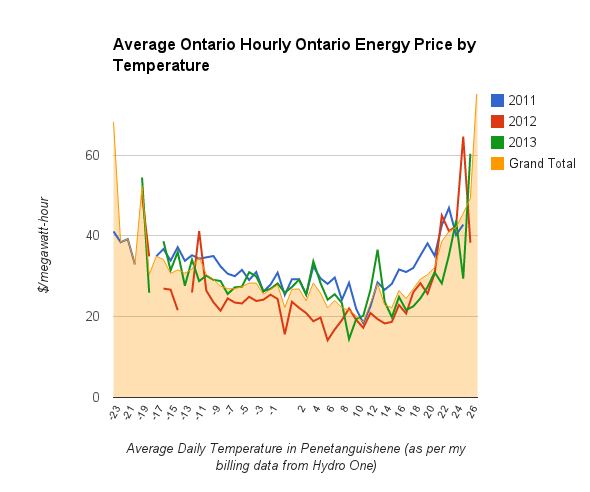 My data has the average daily temperature (in Penetanguishene), so this post will look at the impact of temperature on the electricity sector. Most will recognize that heating, and cooling, are drivers of electricity consumption. 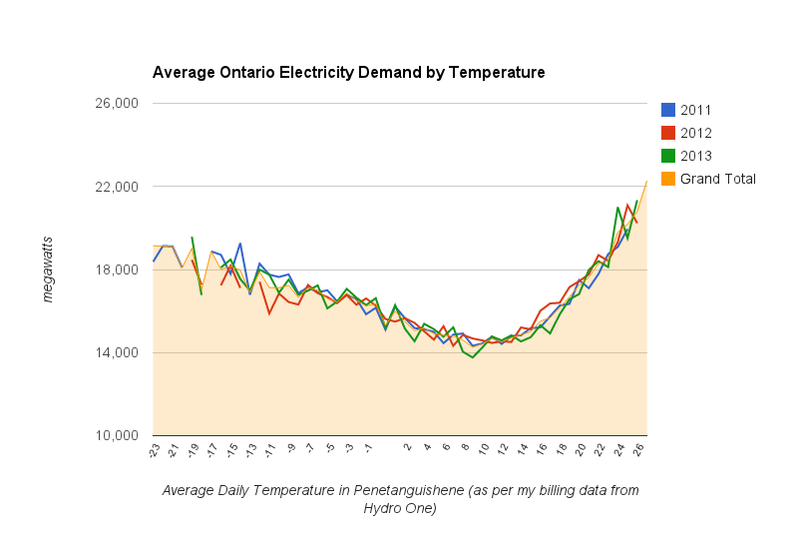 In Ontario, heat more than cold drives electricity demand - thus Ontario is a summer peaking jurisdiction for electricity. But not for energy: natural gas consumption in Ontario is far more variant, increasing roughly 300% in the coldest periods. Getting the expected demand pattern, let's move to price. While price does have the same basic shape, the price at the extremes increases much more sharply, although not nearly sharply enough to justify merchant plant initiatives to fill peaking functions (many jurisdiction have a maximum price of $1000/MWh in their market design, and regions trying to maintain a market not driven by power purchase agreements, such as Texas, are looking at ceilings far higher than that). The conversation on exports usually deals with Ontario's large baseload supply often exceeding it's demand (or load - thus "surplus baseload generation). There's justification for this concern, and certainly 2013 looks to have highest exports at the most moderate temperatures. However, looking at the average (poorly labelled "Grand Total" in the graph), Ontario exports almost decline linearly from coldest to warmest temperature. This is a reminder that the availability of export customers is a second driver of export. With the coal shutdown looming in Ontario, it will be interesting to see the impact of being unable to export during cold days on Ontario's ability to export during moderate weather. If, as seem likely, it requires export markets to develop new supply, it will reduce export opportunities. Industrial wind turbines drop off in productivity as the temperature rises - but there may be an increased chance of performance during extreme heat, and there may also be an increased chance of poor performance during extreme cold. However, in working with peak winter and summer demand hours, I've found that wind will have low productivity (below 10% of capacity) approximately 40% of peak summer demand hours, but also during approximately 20% of peak winter hours. Lastly, a look at hydroelectric output by temperature. The lesson here is that hydro output is fickle - particularly during the warmer months of the year. 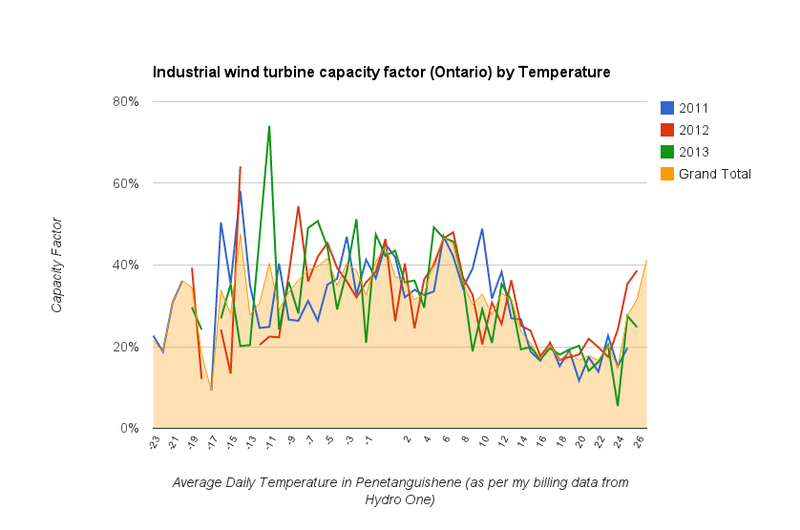 I'd suggest the worst complimentary fit with Ontario's low-reservoir hydro capabilities is industrial wind, which features weak summer performance.